We almost decided to break apart that point, but took a short sabbatical and regrouped in ’77 with a new label Epic and a new line-up. 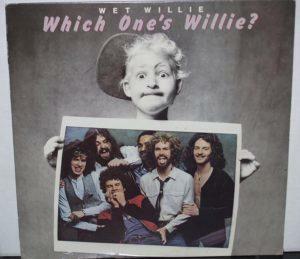 The first single from Which One’s Willie? was a remake of a Mick Jackson song entitled “Weekend” and was, as might be expected, an ode to enjoying a break from the drudgery of the other five days of the week. “Weekend”, a mixture of the Southern rock for which Wet Willie was known and the disco that was dominating the charts in 1979, was moderately successful, spending 12 weeks on Billboard’s Hot 100. It debuted on the chart at #80 for the week ending May 26, 1979 (chart | magazine) and peaked at #29 for the week ending July 28 (chart | magazine). However, the sound of top 40 music was changing rapidly in the summer of 1979. During that summer, Chicago DJ Steve Dahl spearheaded the anti-disco backlash which resulted in Disco Demolition Night being held during a White Sox doubleheader two weeks before “Weekend” reached its peak position. ** And by the time it had peaked, a little tune called “My Sharona” had just leapfrogged “Weekend” on its way to spending six weeks at #1 and marking a major shift in top 40 music toward rock. Suddenly, the disco-rock hybrid sound of “Weekend” was on the outs. The band decided to split up when we didn’t have much material ready for a follow-up project after “Which One’s Willie”. The label said the songs were not strong enough and to wait to record another project. In the meantime, I (Jimmy Hall) as a solo artist was invited to record a solo project for Epic. The band split and went their separate ways to other musical ventures. While Wet Willie hasn’t recorded any new material since 1979, they have gotten back together and still tour occasionally. Interestingly, while their Capricorn Records music is easily found on CD these days, their Epic Records albums and singles are rather hard to find, not even on any best-of collections, which is why you won’t see a link to an MP3 of “Weekend” below. (You won’t even find the Epic songs on Spotify.) And it goes without saying that you won’t find “Weekend” on classic hits radio, though you’ll probably still hear the occasional spin of “Keep on Smilin'” on your local classic rock station. For obvious reasons, “Weekend” would be a good addition for stations having a 70s weekend. * Because there was already another band called Fox. ** It trashed Comiskey Park so thoroughly that the White Sox actually had to forfeit the second game.